I would wager that some Cameroonian polygamists have discovered that maintaining two families isn’t all it’s cracked up to be. I say the same thing about maintaining two blogs. When Kiva gets its dues, you lose out. I apologize. The best I can do is try to share the goods and hope to stretch them twice as far. 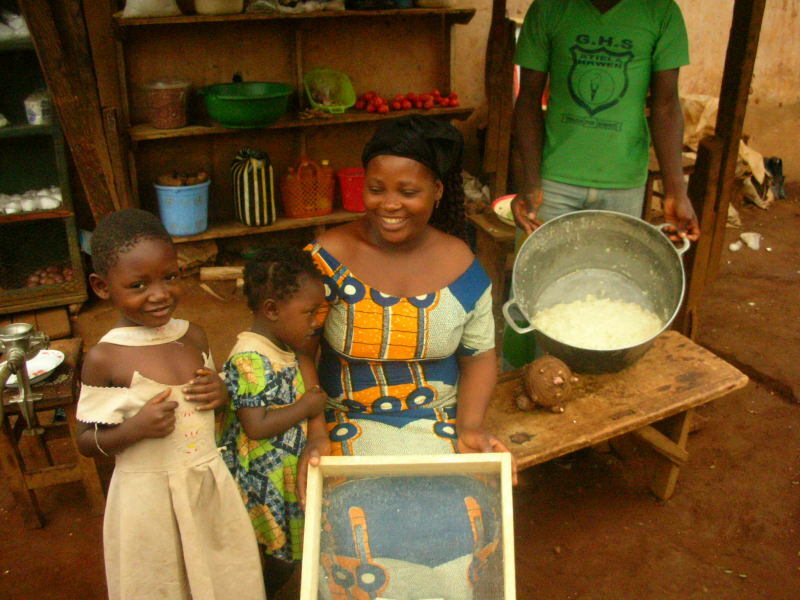 The following comes from our Kiva Fellows Blog. I am proud to say that I have earned two blisters in the last week: one from hand-washing my clothes (I’ve now learned to really scrub ‘em), and another from pulling the kernels off corncobs. As a woman who has earned most previous blisters from breaking in new hiking boots or rowing crew, both luxury sports of a sort, this feels different. Work in its many forms is so deeply ingrained in the culture in Bamenda that it takes shape in language. In pidgin, you would not believe how frequently the words “struggle” and “suffer” are used, usually not as self-pity but rather as matter-of-fact. When someone is getting by, they are “managing.” I suspect you may have to hear these words pronounced in Bamenda to get their full meaning. My favorite new word is “ashia,” a way of greeting, sympathizing with, or appreciating someone who is working hard. The response, if you are a bit confused, as I was the first few times I received an “ashia”, is a simple “thank you.” The best parallel may be saying “bless you” when someone sneezes in the U.S. – although my sneezes here (which I’ve managed to suppress over the years so that they actually sound like the word “achoo”) tend to elicit laughter, since “achoo” is a favorite kind of soup in Cameroon. Ashia has become a special word because there is no direct translation. It expresses something that I cannot express in my English – although when I tried to explain this to some people here, they tried to explain to me that “ashia” is English, meaning here that it is not from any one of the many dialects spoken in the Northwest Province, but is rather part of the common language, pidgin English. Once I finally convinced my coworkers at GHAPE that we really don’t have the word or anything like it in the U.S., discussion ensued. Calista (the accountant) asked, “Well, how do you appreciate someone?” I struggled and pondered for the better part of five minutes, and finally offered the possibilities of “thank you”, “good work”, or “good luck,” none of which capture “ashia.” Could you say “Thank you” to a stranger on the street who you saw pushing an especially heavy load? I’ve discovered that “ashia” is the best way to break the ice of being an obvious stranger. Naturally, as two of very few white folks in Bamenda (I may have seen two or three other white folks in the whole time I’ve been here), we stick out. By this time, five months of travel through West Africa later, we’re used to sticking out and everything that comes along with it – “You are welcome!” How is Cameroon?” “Come here!” “Where are you going?” “White man!” and many other things regularly shouted at us on an everyday walk to the market. I’ve never seen a white man! It doesn’t get much better than that for winning laughter and respect. As far as fitting in goes, well, “ashia” is the best. I can catch someone’s eye as they’re toiling over some project, pronounce an “ashia,” and immediately feel some kind of communion. The communion is enhanced if I adapt the Bamenda way of addressing folks as “sister”, “brother”, “auntie”, “mami”, “pa,” etc. The same day that we discussed the word “ashia,” Auntie Calista (the GHAPE accountant) asked me, “What do you say if you want to give someone respect?” This question also left me without a good response. Of course, we have “sir” or ma’am” but to my American ear now used to Cameroon, these both sound awfully formal. When we say “sir” or “ma’am” it is usually in a formal context, almost pushing someone away from us as we offer respect. In Cameroon, these respectful terms are add-ons to someone’s name and at least in feeling bring them closer. To an older woman or a woman I want to respect, I can say, “Auntie” or “Mami” (pronounced like mommy). To an older man, I can say “Pa.” To a woman about my age, I can say “Sister.” All these show respect and immediately break the ice for me, a “stranger” as they say here. Not that there’s much ice in Cameroonian culture. Using these terms of respect, I don’t feel like I’m dancing the who-can-out-polite-who dance that I’ve felt in other parts of the world. I don’t ever feel like I’ve given someone offense. And, nearly every argument or serious discussion I’ve witnessed in Cameroon ends in laughter, usually a burst of it that comes out mid-rant as if someone has suddenly heard themselves talking or seen things form a bird’s eye view and finds it all hilarious. This is a culture I enjoy settling into. Where is your other blog site? I have caught up with the reading on this one? Any recent entries? Amazing adventure. Just back from Cameroon yesterday, Buea/Bonjongo/Wotutu and really appreciate your entry. ‘White man!’ was a popular cry among school children for my husband. In turn, he taught them to say, ‘Howdy, y’all’ LOL.